Kitty is fed up. Dogs have all the fun. They can play in the park, howl, chase robbers, and even be film stars. Cats don’t do much that’s very exciting. But Kitty’s owner thinks she’s forgotten all about being a cat and lists all the best things they do, along with some of the more stupid habits of the average dog. Cat-owners will like this as feline independence definitely comes off best. It’s a ‘grass is always greener’ story about appreciating what you have. Lydia Monks has a bright, witty style and the double page of the dogs in the park has plenty to point out and discuss. The dog looks particularly miserable in the scenes showing the downside of being canine and his appearance in ‘disguise’ as a cat on the final page is quite funny. This is a decent-enough book. There is a positive if slightly simplistic moral and older children could benefit from a discussion about their own likes and dislikes about being themselves – would they actually want to be someone else? 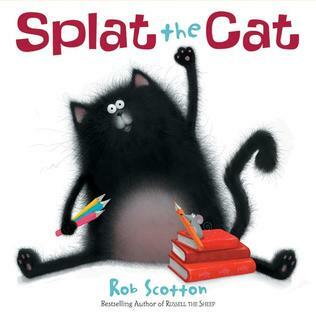 In general however the story lacks any real narrative and suffers from double-standards: the poor dog looks utterly depressed when told how stupid he is and at the end he wishes to be a cat himself, somewhat undermining the book’s apparent message of self-acceptance. The text too is printed in a bold font which is intrusive and uncomfortable to read. Mog is not very clever. She tends to forget things, like washing the rest of her leg when halfway through it, or that she has already eaten supper. Most of all she forgets that she has a catflap. Instead of popping back in by herself, she hops up onto the windowsill and miaows loudly to be let back into the house. Nobody in her family is very impressed by this behaviour. Poor Mog runs outside and sits miserably in the garden for a bit, thinking dark thoughts. She also thinks she hasn’t been fed (which she has been, of course). Then she spots a small light moving about in the kitchen, and wonders if the strange man with a torch might be planning to feed her. Judith Kerr’s book does show its age (if nothing else in the pelmet-like length of Debbie’s skirt!) but it is still a classic book. The clipped, rather repetitive sentences may seem old-fashioned but are ideal for children learning to speak and to read as they model simple, grammatically accurate structures. “The garden always made Mog very excited. She smelled all the smells. She chased the birds. She climbed the trees. She ran round and round with a big fluffed up tail.” There are some great humorous moments (usually at Mog’s expense) such as when she sees it’s raining in the back garden and wonders if it might be dry out at the front! The other good thing about this book is the extent to which the pictures form part of the story. Visual literacy is an important part of child development and it also allows opportunities to talk about what is going on in each picture. Explore and discuss them with your own little bookworm. A classic book that is still worth reading today. With admirable arrogance, Sid has adopted an entire street as his own. Not content with popping in for food occasionally he has created a sextet of alter-egos, each with its own name, personality and favourite dinner. “As Sooty he smooched, but as Schwartz he had to act rough and tough.” Each night he heads off for his six dinners, “rounding at off at number 6 with beef and kidney stew”. Life is pretty much perfect for Sid, until he comes down with a cough, and is taken six times, in six different ways, to the same local vet. With his secret exposed, Sid’s owners sternly restrict him to only one dinner a day. Sid, however, has other ideas. Sid’s efforts to claim meals from most of the neighbourhood will strike a chord with all cat owners, and children will admire Sid’s cunning and resourcefulness. The written style is simple, but the lists of Sid’s dinners and names, as well as the constant emphasis of the number six, make for very effective reading. This is echoed in the illustrations, neatly stacked in squares like a comic book and showing the six different ways Sid travels to the vet, as well as the six spoonfuls of medicine he is forced to endure! 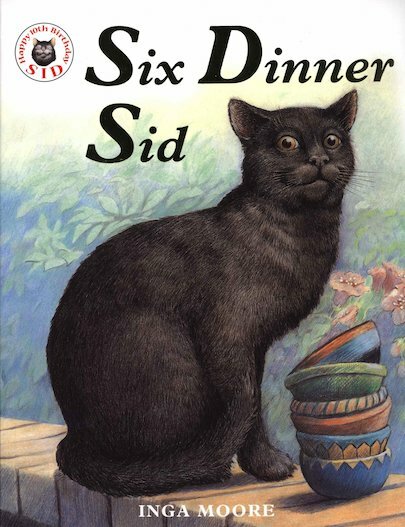 Six Dinner Sid won the Smarties Prize when first published, and is now a staple of Early Years teaching. Despite the simple story, there is a lot of potential for discussion, particularly around the personalities in Aristotle Street. The drawings of the various owners show how different they are, and it is the fact that they don’t talk to each other that allows Sid to get away with six dinners for so long. In his new home at the end of the book everyone talks to everyone else, and they all know and accept Sid’s behaviour. If you are reading this with a slightly older child, why not chat with them about this? Or perhaps talk about Sid’s antics – is it right that he manipulates everybody in the way that he does? How would you feel if you were Sid and your secret were found out? This is a highly enjoyable book with enough humour for adults and one easy to read with plenty of expression. With older children it has the depth for discussion, but the detailed illustrations and fluent text should make it accessible for toddlers as well.